How to Provide Natural Support to Heart & Blood Circulation, Using Finest Herbs of Ayurveda! 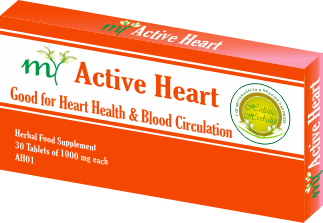 Holistic Herbalist cordially introduces 'My Active Heart' - herbal supplement for natural heart health and healthy blood circulation. Heart and blood vessels are working relentlessly in providing nutrition to each and every cell in body and taking away the metabolic waste material. If your heart could speak with its beats and tell you about itself, you will simply be mesmerized and express your gratitude toward what it is doing for you, for keeping you alive. Every minute, I beat about 70-80 minutes and push blood to the farthest nook of your body. I never rest or stop during the whole course of your lifespan. Every minute, I help to circulate about 5 liter of blood into your body, every day about 7200 liter and every year about 2.6 million liter, and 184 million liter in your average life of 70 years. Can any other pump in whole world match my working capacity? Perhaps, you don't know that with every beat, blood sent out by me travels through 60,000 miles long network of blood vessels. It would well be over 4 times the circumference of Earth! I am not just like any other organ! Even though, thoughts, feelings and emotions are created in brain, I am the one through which you feel their impact. That is why literature, right from ancient times to present one, associate me with positive and negative emotions. I am thankful for serving you to infuse pulse of life with each my beat and hope that you would truly live a remarkable, loving and contributing life. The Synergy of 3 Factors truly make a Balanced herbal supplement for healthy heart and healthy blood circulation? Heart has a unique type of muscle - Cardiac muscle. Its health is incomplete without the health and integrity of network of 3 types of blood vessels. Veins that bring back blood to heart. At Holistic Herbalist, we tried out best to represent the synergy of traditional wisdom of Ayurveda and modern herbal researches and presented 'My Active Heart' for total wellbeing of your heart and blood circulation. As the 20th century reached midway, the modern Civilization and lifestyle induced disorders like hypertension, heart attack, stroke, diabetes and obesity plagued the society. And they are increasingly doing so despite tremendous advancement in medical care and surgical intervention. Truly speaking, heart is a very strong muscle. Nature provided extensive loops and feedback mechanisms in human body that brings it back to normalcy when temporarily it goes out of sync and balance. On a very general basis, the principal role of heart and blood vessels is to distribute oxygen and nutrients to all cells of body and take back metabolic waste and carbon dioxide. Cardiac muscles do need oxygen and nutrients to feed them like any other part of body. Both of them put extra load on heart and weaken its strength and further worsen the condition. 'My Active Heart' has Arjuna, Indian Elecampane root and Gotukola that have been extolled in Ayurveda for their beneficial effect on heart and circulation. Guggul, Garlic, Turmeric and Hing Asafetida helps in regulating metabolism, especially fat metabolism, and general digestion, and thereby supports the healthy form of cholesterol in blood. Tribulus is good for strengthening the muscles and in cleansing the toxins through urine. Holy Basil and Turmeric provides general antioxidants to protect against free radical damage. I got great help in both high blood pressure and cholesterol levels with this herb. This has provided excellent relief and I value these herbs highly for ensuring natural health for my family. WHAT IS THE PACKAGING OF MY ACTIVE HEART? My Active Heart comes in two packagings. Bottle or Box. One box or bottle contains 60 Tablets of 1000 mg each. Generally, any adult person over the age of 16 can take 3-4 tablets daily. You can take 2 tablets after lunch, and 2 tablets after dinner; or 1 tablet after breakfast, 2 tablets after lunch, 1 tablet after dinner. It can be taken with water or juice or milk, after breakfast, after lunch, or after dinner. My Active Heart is perfectly safe combination of Ayurveda herbs. This is a very specific herbal supplement. You can easily take it continuously for 3 months, 6 months or 1 year. CAN I TAKE MY ACTIVE HEART DURING PREGNANCY & BREAST FEEDING PERIOD. DO YOU SUGGEST ANY OTHER HERBAL SUPPLEMENT WITH MY ACTIVE HEART? We highly recommend My Joyful Mind and / or My Active Liver along with My Active Heart. You can take only 2 tablets of My Joyful Mind daily, and only 2 tablets of My Active Liver daily. My Active Liver is essential aid when you are taking My Active Heart for naturally managing high blood cholesterol. My Joyful Mind is an essential supportive supplement for My Active Heart in natural management of High Blood Pressure. GET THE GOODNESS OF ALL THESE WONDERFUL HERBS FOR KEEPING HEART HEALTHY, IN EVERY TABLET! I am a retired Government executive and I was already on antihypertensive drugs before starting this Ayurveda product. Initially, for 2-3 weeks, it didn't give much benefit. After using 1-2 months, I felt great relief in high blood pressure. My requirement of medical drugs have come down. This herb is having very gentle and lasting effect. 1 Month Supply = 1 Box / Bottle of My Joyful Mind + 2 Box / Bottle of My Active Heart, 1 Box / Bottle of My Active Liver. 1 Month Supply, US$135, US$100 Only, Save $35.